As the mumblecore ranks have grown in number, releasing stars like Greta Gerwig and Mark Duplass into prominence beyond the indie sphere, the mumblecore term has lost much of whatever descriptive value it once had; now, it refers broadly to micro-budgeted, semi-improvisational films of virtually any stripe. Yet that first instance, Andrew Bujalski’s 2002 debut feature, Funny Ha Ha, remains a true thunderclap, an original, audacious attempt to replicate the patterns of everyday speech (all false starts and “ums” included) into a film while offering real insight into human relationships. With Mutual Appreciation in 2005 and Beeswax in 2009, Bujalski both refined that style and showed signs of evolving beyond it. He was still better than anyone at articulating inarticulateness, but he had folded it into a subtler, less mannered kind of naturalism. 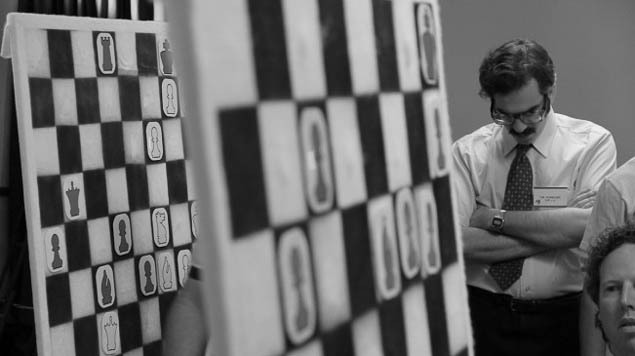 Bujalski’s feel for the halting rhythms of communication carries over into his latest film, Computer Chess, as well it should, given the confluence of socially awkward computer programmers at its center. But the film is also a great, thrilling leap into new and wholly original territory for Bujalski, a deeply strange, deeply funny comedy about analog techies in the mid-1980s that detours into hard science fiction, surrealism, and middle-aged hippie-cult sensualists. Shot on a Sony AVC-3260 camera—a black-and-white vidicon tube camera that significantly predates the period—Computer Chess functions both as an uncanny facsimile of found home-video footage and a cheeky rebuke to the current wave of slick digital options for indie filmmakers. If Bujalski must shoot on video, the film implies, it’s damn well going to look like video. 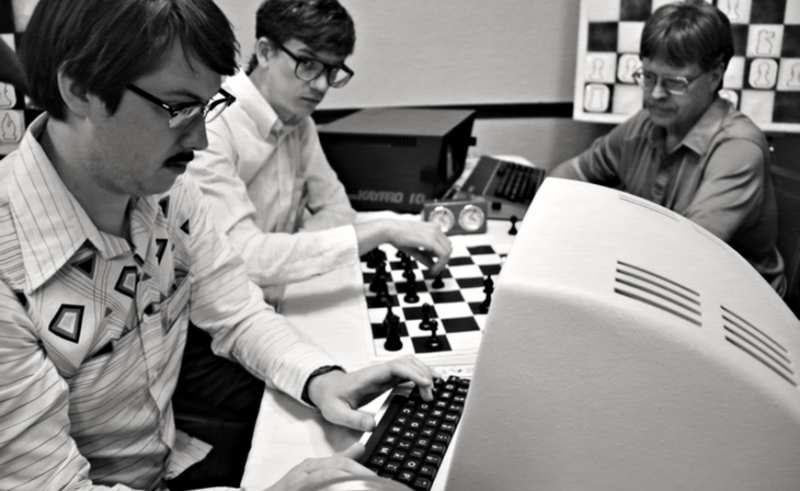 Were Bujalski less ambitious, Computer Chess would work swimmingly enough as a conventional—or at least relatively conventional—comedy about nerds competing with other nerds for programming supremacy. Gathering for an annual convention at a modest hotel, the brightest engineering minds of MIT, Cal Tech, and other tech outfits pit their computers against each other in a chess tournament. The winning team gets $7,500 and a chance to test their AI against human chess master Pat Henderson (played by film professor, critic, and scholar Gerald Peary), the event’s doddering, irascible host. The Cal Tech team won the year before, but their latest machine, the Tsar 3.0, starts making moves so inexplicable and stupid that leader Martin Beuscher (Dazed And Confused’s Wiley Wiggins, still hilariously exasperated 20 years after playing an incoming high-school freshman) forfeits one game before it even starts. Others fare better, like the MIT group (which includes the event’s only female, who withstands many stilted advances) and the mysterious Michael Papageorge (Myles Paige of Funny Ha Ha), an independent programmer who arrives with plenty of contempt, but little cash. Another such nomad is Peter Bishton (Patrick Reister), a painfully shy Cal Tech team member who suffers the twin anxieties of Tsar 3.0’s catastrophic failure and a basic problem relating to other human beings. When Peter encounters a swinging couple from the New Age-y group sharing hotel space with the programmers, his hyper-rational mind is no match for their dumb babble about human potential, or the unnerving ease with which they liberate their bodies. Bujalski turns Peter’s wanderings into a coming-of-age movie in miniature, capped by a brilliant denouement that ties it back to the classic science-fiction questions that haunt much of the film. Beyond the fun of watching these men (and one conspicuous woman) cart around giant processors and extract data from printouts or clunky monitors, Computer Chess is sincerely fascinated by a point in history where computer scientists were trying to get a handle on artificial intelligence. We know now that computers have the capacity to outwit even the world’s greatest chess player, but back then, machines’ capacity to match the sophistication and creativity of the human mind was still an open question. Bujalski taps into the excitement of those conversations, which are as much philosophical as they are scientific. Much of the pleasure of Computer Chess comes from watching Bujalski go so far out on a limb—with the primitive black-and-white video, the odd hiccups of experimentation, the willingness to break off into unexpected tangents. There’s a formulaic movie embedded in the narrative—one soaked in 1980s tech nostalgia, and open to 1980s-style training montages of programmers beefing up their computers for the big tournament—but Bujalski does everything he can to resist the easy path and peel off in other directions. Computer Chess may seem like a novelty item, but it’s that and more, accumulating insight and substance without ever losing the fun of being a lark.